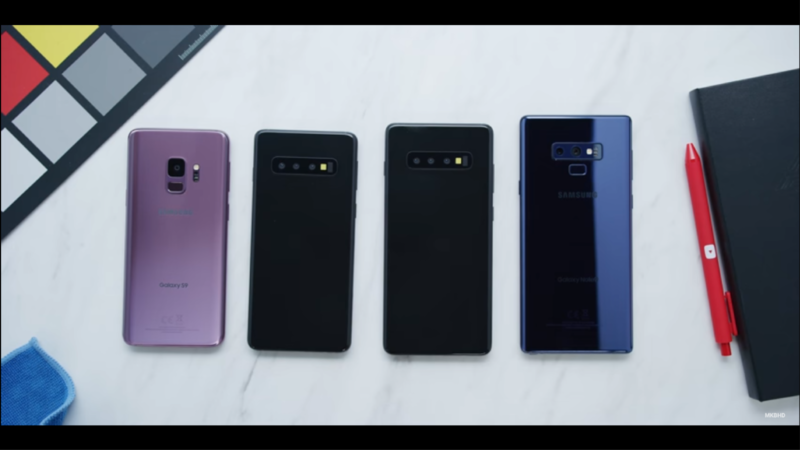 As if there were not enough leaks about the phones, Samsung Galaxy S10's all three models appear in a brand new video. This video confirms what we already have seen and read about the device. Famous Youtuber Marques Brownley got his hands on the dummy models of Galaxy S10 that case makers use to manufacture their products. The tech Youtuber is right in observing that the phone looks like a mini Galaxy Note 9 because of the more square curves. The Galaxy S10 will have one punch hole at the front for the camera while Galaxy S10+ will feature two, with Infinity-O display. The dummies show Triple rear cameras with flash and other sensors at the back which confirms that the series will have an in-screen fingerprint sensor. We can also see the dedicated Bixby Button at the left as expected. Samsung will show how true all these leaks and renders are in the unveiling on February, 20th at San Francisco.